New techniques really interest me, and by this I mean ideas that I have developed myself. They may be half-baked ideas, and in fact I’m often certain that they are. But my mind has been racing in recent weeks as I plan an autumn and winter campaign and look back on certain sessions in the spring and summer which, while not red letter days, have given me pause to think. 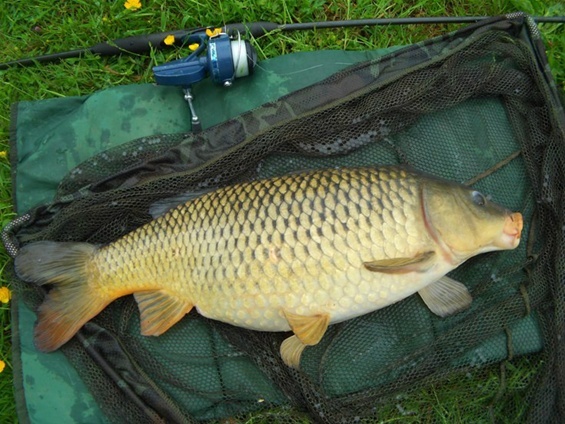 I do believe that carp fishing is in danger of becoming a pastime, not a pursuit, because the tendency for many years has been towards known fish in known waters which are caught with the aid of self-hooking rigs and heavily marketed baits, usually boilies. I’ve come to realise that I just don’t want to fish like that. I want to be, to coin a phrase, a pursuit carp angler: someone who pursues the traditional carp fishing experience; someone who fishes for unknown fish, regardless of size, while developing his own styles, ideas and methods. I’m not seeking to convert anyone, in fact I wouldn’t presume. But I know that, to keep myself interested in the game, I must create my own angling circumstances and not rely on shoves from commercial interests towards a form of angling that, to all intents and purposes, is largely artificial. As I have already intimated; I wish to develop my own style in pursuit of natural fish; - carp that are large, if they are large, because of Mother Nature, and not due to any other factor. This, surely, is how carp-fishing was until big business, and the need for instant gratification, spoilt it all? How then, would I sharpen up my definition of pursuit carp angling? Well, I think the ideal is to find a water that has not been fished previously, or hardly at all, and to be a pioneer. If a lake has known and named big fish, perhaps it should be struck off the list. Of course, highly suitable waters are hard to find – but I think that most canals would qualify, and most rivers too. Pools and ponds are more of a problem – but Google Earth can be a godsend for any piscatorial quest. Unfished ponds in the UK are likely to be Redmire-sized, three acres, or smaller, and so this should inform the tackle choice of the pursuit carp angler. There will be no need for big pit reels and long-casting carbon “beachcasters”. In fact, for most carp fishing situations in the UK, the ‘old school’ carp rods are much better – such as the MK IV, - in cane, fibreglass or carbon. The two important things to consider, however, are action and test curve. You’ll be fishing close in and so you need a through action rod, quite soft by modern standards, with a test curve of between 1.5lbs and 2lbs. My rod of choice, for what it is worth is the Amorphous Kevin Nash Stalker, the AKN 116 – 11ft 6 inches long with a test curve of just over 1.5lbs. Most modern carp rods on sale in most UK tackle shops are unsuitable for the majority of British carp waters, in my view. Reels can be lighter too. You’ll be fishing the margins on many occasions and so you can get away with 100 yards of line. Why not use an old Mitchell? I love the 300, but my current Mitchell of choice is the 410a, because it is so smooth, due to ball-bearings. I double up the Teflon disks in the clutch to make the clutch extra smooth. The weight is a little over 11oz. Modern match reels, as used for commercial matches where carp are expected, are also likely to be rather good for our purposes. Let's be honest, modern clutches are usually remarkable and a carbon-fibre body will knock a few ounces off the weight of any reel. I have a strong work horse, made by Leeda, which weighs in at just over 9oz. I keep hammering on about weight, because in my experience, the lighter the reel the crisper the strike, and that's important. Thinking of unknown pools, and a large one in this case...only yesterday, while studying Google Earth, I noticed something that I can only take to be a large, abandoned, water-filled quarry. It's within range of my home and yet, in the 15 years I've lived where I do live, no one has ever mentioned this lake. It is at least 9 acres, I'd say, with inlets and islands and weed, and it's in a pretty remote location too. It looks amazing! Perhaps it is devoid of fish; but it does require serious investigation. The unfished waters are out there, and they can be found. of course I have "The Other Pool", which is an irrigation reservoir that was stocked 30 years ago and, until last year, only fished once - and that was 15 years ago, when it yielded a twenty for one angler. Now that's what I call potential. I generally only use one rod at a time, because banks will be overgrown, swims will be narrow and it pays to keep mobile. I realise, at this point, and with a growing sense of shame or embarrassment, that I am probably preaching to the converted; but bear with this lone man, hammering out his thoughts on an overcast autumn day. I’m only rambling, and perhaps I'm also ranting! However, I do think carp fishing is changing in the UK because many anglers, people who revere the pursuit, are looking to the past for inspiration; and this is not always a merely nostalgic journey. I think it’s grand to make your own floats and bobbins if you can, and to come up with ideas and methods that – perhaps – no one before has used to their full potential. I think it’s inspirational and liberating to leave boilies and heavy baiting behind, and lead-core, and crimps, and dissolving PVA bags too, and rod-pods, and the whole damned shooting match, - and try to make a fun but serious attempt to catch uncaught carp on the simple baits of yesteryear, perhaps, “by finding the fish and not scaring ‘em”, as Walker said. I also believe that a true angler always makes a strike. Only a trapper picks up a rod to reel in a self-hooked fish. But I suppose I am not truly a traditionalist, because I’ll happily use carbon and I think we are in a golden age for lines and hooks. For instance, the Nash Fang Twister hook, I’ve found, is the best bread flake hook I’ve ever used; and I think I’m discovering some interesting “off the wall” uses for floating line – such as the Korda Kruiser stuff. Remember when I mentioned my “half-baked ideas...?” Well, I’ve used it as a bottom line, in certain circumstances, and it seems to generate some very positive takes. Is that because it is, basically, ‘critically-balanced” and the drag is very much reduced, compared with traditional lines? That is possible, certainly. I’ve used it close in, when the water is choppy and the wind is in my face. I’ve freelined big hunks of flake on the bottom in this situation and, rather than pinning the bait down, I think the line makes it much easier for the bait to lift in the chop, - and I suspect this is often the moment when a carp moves over and grabs it! I’ll need to do a great deal more fishing like this to be sure of the concept– but ideas like this keep fishing far more interesting for me. I’m often a lonely soul on the bank, with no one to talk to but myself. There’s no one about to tell me I’m being silly! Company is fine, but what could be finer that being alone on a water with real potential, but un-known potential, and seeing those frothing bubbles approach your bait? Seen above: an immaculate, flake-caught common from a lonely pool. You won't regret it, Chris; they are amazing! Finally got myself a pair of Amorphous AKN116 stalker rods Gary! Yes, Martin, a lovely social evening - must do it again soon - and I needed two tablets afterwards, just like in Ireland! Interesting that. Personally I use a Cardinal 66x (+ carbon drag washers and a re-profiled spool lip) and a 1.5lb Hexagraph Avon. Similar stuff. Yes very similar! I've owned a Cardinal 66 - and I loved it, and I'd also like to own a Hexagraph, you lucky person! Thanks David - I just think there's a difference between social gatherings and actual fishing, although it's nice to be social from time to time, of course! Very interesting reading and i agree too ,solitude on a nice carp pool, akn 116s rod ,what more could we want eh . kindest regards . Woolly Bear . TFF .